The most personal portraits happen, not in a studio, but out in the real world, where people live. To that end, my number one choice is to create portraits at your home. Home is where you feel most comfortable, and home is where authentic portraits happen most easily. So, long before the portraits themselves are created, I meet with families in their home. We get to know one another. We build rapport. We plan the portraits. We look at you home as the setting for your portraits. And if home looks like the best place, that is superb. And think of the luxury: you don’t go looking for me, I come to you. Another wonderful setting for your portraits is on the grounds of the Philbrook Museum. 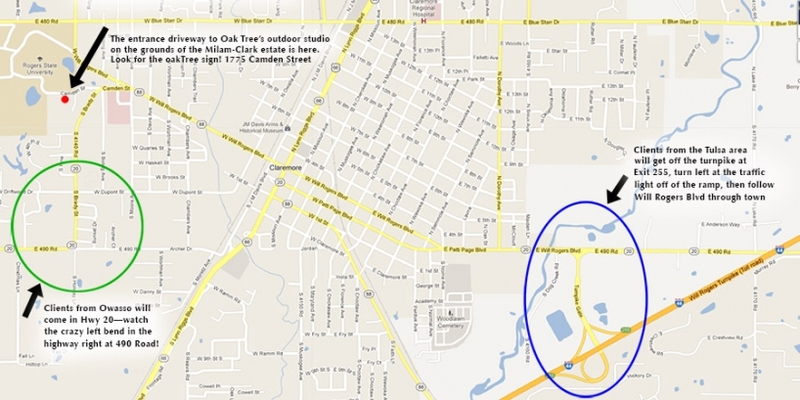 I am one of a handful of Tulsa photographers who create portraits at this exclusive location. There are 23 acres of gardens, trees, fountains, the Italian villa of Waite and Genevieve Phillips, and, of course, the tempietto, all of which make for a one of a kind setting. There are bathrooms for freshening up or changing, as well as Acer, the Philbrook cat, to keep you company! 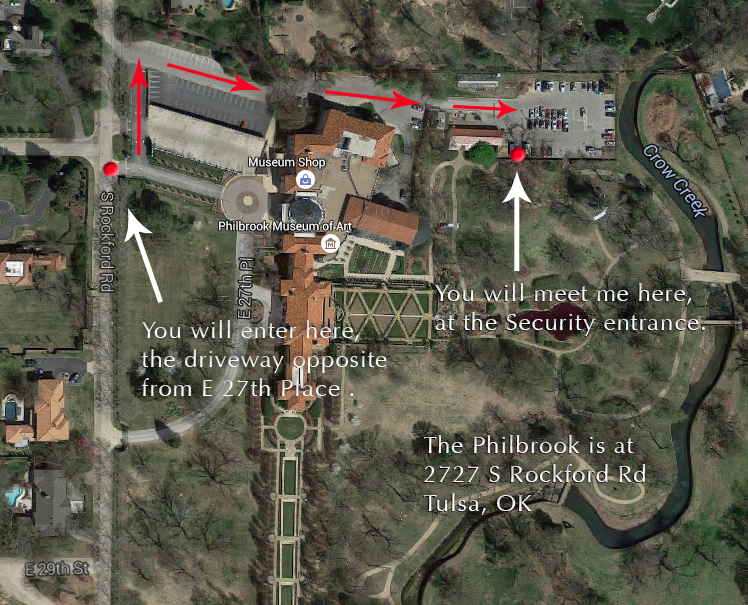 The map displayed below will show you where to meet me at the Philbrook, located at 2727 S Rockford Road. As yet another splendid locations, the Milam-Clark estate in Claremore is an impressive two acre site with massive oaks, open vistas, and extensive flower beds. Along with the natural features, there are also stone, brick and wrought iron elements that make for a great variety of backgrounds for portraits. Along with the natural and man-made beauty, the estate is situated such that it enjoys natural screening from the prevailing winds. This means that, even when the wind is howling elsewhere, the Milam-Clark estate is whisper still: no need to worry about the wind blowing your hair around and spoiling the portrait! In addition, there is access to a bathhouse bathroom for the convenience of freshening up and changing clothes. How convenient! Originally built and owned by J.B. Milam, the principal chief of the Cherokee Nation from 1941-1949, this estate is now presided over by Mrs. Evelyn Clark. The Milam-Clark estate is located at 1775 Camden Street in Claremore.